Having tons of fun in the terrain parks! The National Ski Areas Association and Burton Snowboards have developed the Smart Style Freestyle Snow Safety initiative, a cooperative effort to continue the proper use and progression of freestyle terrain at mountain resorts, while also delivering a unified message that is clear, concise, and effective. Calabogie Peaks adheres to the guidance, logos, and signage developed through the Smart Style Freestyle Safety Program. Our park and safety signage are designated by an orange color. Almost all the terrain at Calabogie may contain jumps, hits, ramps, banks, fun boxes, jibs, rails, half pipes, quarter pipes, and other constructed or natural terrain features. Calabogie Peaks also promotes the National Ski Areas Association’s Smart Style terrain park safety program that emphasizes the proper use of terrain parks. The Smart Style video, along with TerrainParkSafety.org, work together to emphasize the importance of safety in terrain parks. 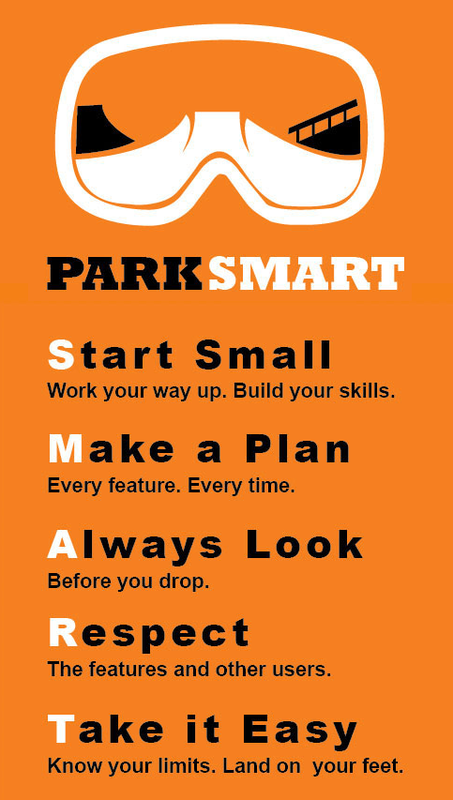 Please visit TerrainParkSafety.org for a comprehensive look at the Smart Style program. Your condition, speed, balance, body movements, alignment, trajectory and maneuver difficulty will DIRECTLY AFFECT YOUR DESIRED OUTCOME. Know the intended use of the Freestyle Terrain you have chosen. Transitions are changes in the shape and pitch of the snow or feature or changes from one type of sliding surface to another. Transitions can be gentle or abrupt, and demand that users be alert and respond to them with accurate movements. Know where to land. The SWEET SPOT is between the “knuckle” and centre of the landing zone. Even if you land on or near the sweet spot, you can still be seriously injured or die if your landing posture is not correct. INVERTED MANEUVERS ARE NOT RECOMMENDED AT CALABOGIE PEAKS. BE AWARE that features change constantly due to snow conditions, weather, usage, grooming and time of day. Read and obey all posted signs, instructions, and warnings before using Freestyle Terrain. Some resorts designate features as small, medium, and large. Be aware these ratings are determined by size, not degree of difficulty, and are relative only to that resort. Approach zones are the spaces for setting speed and stance to use the feature. The Takeoff zone is for making moves that start your trick. The Maneuver zone is for controlling your body in the air and setting up for landing. Landing zones are the prepared slope between the knuckle and the runout beyond it. can be enjoyed in many ways. At ski areas, you may see people using alpine, snowboard, telemark, cross-country, and other specialized ski equipment, such as that used by disabled or other skiers. Regardless of how you decide to enjoy the slopes, always show courtesy to others and be aware that there are elements of risk in skiing that common sense and personal awareness can help reduce. Observe the code listed below and share with other skiers the responsibility for a great skiing experience. Observe signs and warnings and keep off closed trails. The Smart Style video is brought to you by the National Ski Areas Association (NSAA). For more park safety tips, please visit www.terrainparksafety.org or www.nsaa.org. The Calabogie Freestyle Club offers an exciting winter program for young athletes to learn under the experience of seasoned and certified coaches. Learn more. BE SAFETY CONSCIOUS AND KNOW THE CODE – IT’S YOUR RESPONSIBILITY!